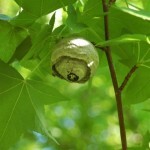 Last month I was unpleasantly surprised when my wife pointed out a large nest in one of our trees in the backyard. We have about 20 trees or so back there, so I hadn’t really noticed it, but she assumed I had. Our nest is much bigger than this one! When I took a look, I confirmed that it was a hornet’s nest. Hornets are nasty, and can sting you more than once. When I saw how big the nest was (about the size of a basketball), I figured I should check about how to get rid of it, especially that it was in a tree that was right over the middle of the yard. It was about ten feet off the back of the deck, and also in a path where we cross to get to kids stuff, like the sandbox or swing set. The biggest issue I knew we would run into was how high the nest was off the ground. My wife pointed out another one that she knew of in the neighborhood that was about six feet off the ground. Our trees are trimmed very high so that we still get sunlight to the lawn and such, so although that was at the lowest branch on the tree, it was probably still about twenty five feet from the ground. The first place I called was Orkin. They said they would come out and spray it for $250. That seemed like a high price to me, and so I figured I’d call around. I called the guy that I use to cut and trim trees and he figured he could ‘help me out with it’. When I explained everything to him, he thought the best way would be to put a big stepladder on the deck, where you could probably get close to parallel to it, then spray it from across the way. He admitted that he was coming up with this on the fly, as his normal approach when he was cutting trees in wooded areas is just to cut the next down, spray it with gas, and torch it. My first response to that was, of course: “That would be awesome.” Though, we both realized that this wouldn’t work in the best area. With that, he admitted that he was coming up with this on the fly. I started thinking about things like how you would get down from the ladder in time if they came after you (did I mention they were mean?) as well as how you would get spray in the side of the next that you weren’t facing. I asked for advice on Facebook as well as a couple of other people whom I know have wooded areas, and the advice I received was to just leave it alone. Given that they’re so high up in the air, I was told, we are likely not in the radius where they would consider a threat and launch a large scale attack. The closest we are at any given point is at least 25′ away, whether that be standing on the ground directly underneath it or any point around the deck. You might have one or two that could be on their way to or from the nest that you might have to deal with, but beyond that, you’re far enough away that they’re not going to bother you. I also found out that hornets will not re-use the nest next year. After the season ends and the cold gets them, the new queens will go find somewhere to take shelter for the winter, likely slightly underground, and will start from scratch next year. So, for now, I’m planning on a wait and see type approach. One sting might change that, or if I see any sign of activity (every time I’m back there cutting the grass or anything like that, I’ve got one eye in the air), it could change my strategy, but so far I haven’t been compelled to do anything. My biggest worry will be when it’s time to rake leaves, since we’ll be back there for extended periods of time. I guess we’ll cross that bridge when it comes time, though with the way 2013 is going, perhaps we’ll have a good hard frost or two early in the season which would likely get rid of them. 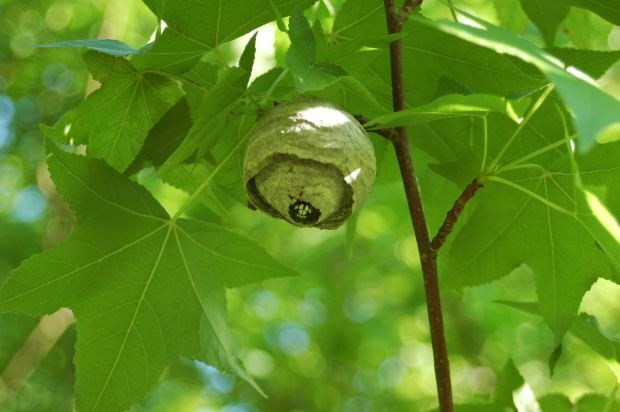 Readers, have you had to deal with a big hornet’s nest? What are your stories? I would handle the problem in a much more inexpensive and simpler manor but wouldn’t recommend anyone else do the same. I would purchase two cans of wasp/hornet spray that can empty the entire contents of cans in just a few seconds. Next, I would stand 15 to 20 feet from the nest with a way to easily run for cover if needed. I would do a test aim at the nest and then let the streams rip for about 1-2 seconds and then get the hell out of Dodge. The low grade nerve toxin in wasp/hornet spray usually kills them on contact so you don’t really need that much of it to get on the nest. Your problem should be solved within a few hours. Of course, you will only be able to use this method if the propellant in the cans and push the poison high enough the reach the nest. The issue is that the nest is easily 25 feet off the ground. I took a can out there just to check and it was easily 10′ short of being able to reach.